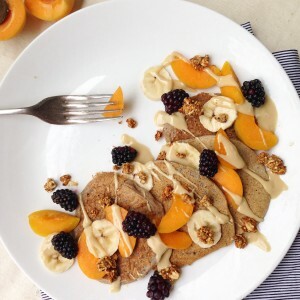 Adding a little protein powder or egg white and using buckwheat and oat flour means that these will be packed full of protein and low Gi carbs, keeping you full for ages and making this a great post-workout recovery meal. Plus they taste awesome, not too much maple syrup needed here. Approx ½ cup almond milk or milk or choice. In a small bottle blender grind up the oats ad buckwheat into a flour. Add remaining ingredients and blend to a smooth batter. Heat a non-stick pan on medium and add spoonfuls of the batter. Cook pancakes each side until set (hint, if you are doing these egg free, make sure you cook the first side well first before flipping so it holds together well. Serve with fresh seasonal fruit and your favourite nut butter or some natural yoghurt.